Good evening to all! With it mid-December, I am starting to feel pretty jolly and I hope you have similar feelings as well. I am excited about this week’s Thursday Rundown so let’s get started. First Place – Sloan’s daycare, Oxford Children’s Academy, is always offering fun events and community building activities. To celebrate its birthday (which was on Dec. 11), OCA challenged families to make a video commemorating the milestone. If you know me well, it will come as no surprise that I couldn’t resist. Sloan, Sidney, and I sat down and recorded a video from the heart. It was announced today that we won first place (and a $50 tuition credit)! To watch the video, click here. 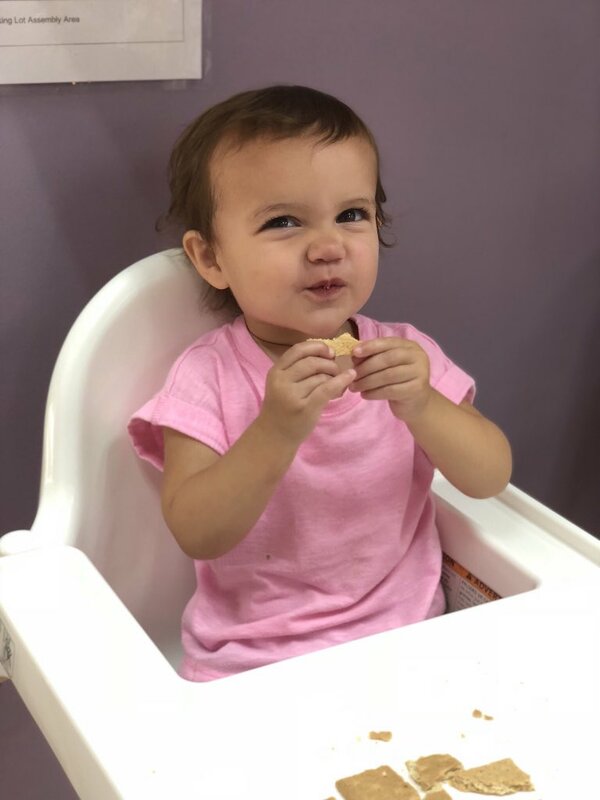 As we reflect on our many blessings this holiday season, one thing that sticks out is how fortunate we are to send Sloan to such a loving daycare. 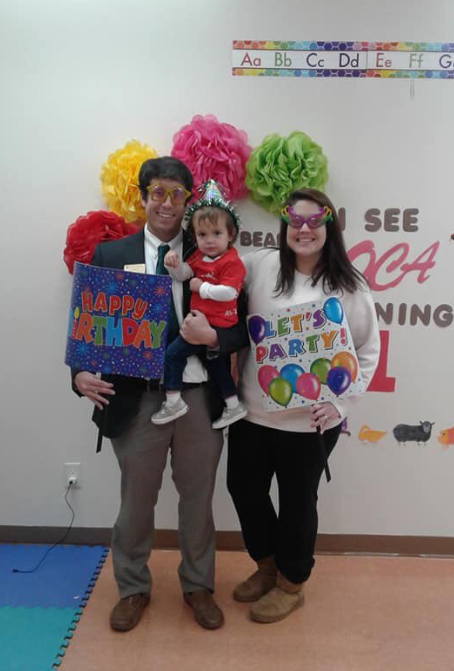 As part of Oxford Children’s Academy birthday festivities, a photo booth was set up. We are so pleased to send Sloan to OCA and completely honored to have won 1st place in the video competition! Sloan’s Santa Saga – As I mentioned last week, Sloan has Santa issues. This past weekend, we tried to make some progress with her phobia. We attended a delicious Breakfast with Santa event put on by the Knights of Columbus at St. Andrew. Unfortunately, the tears still flowed when we put her on Santa’s lap. But, there was a bright spot (other than the food)! The Knights of Columbus must have some type of “in” with Santa because he brought Mrs. Claus with him. It turned out that Sloan loved his better half. 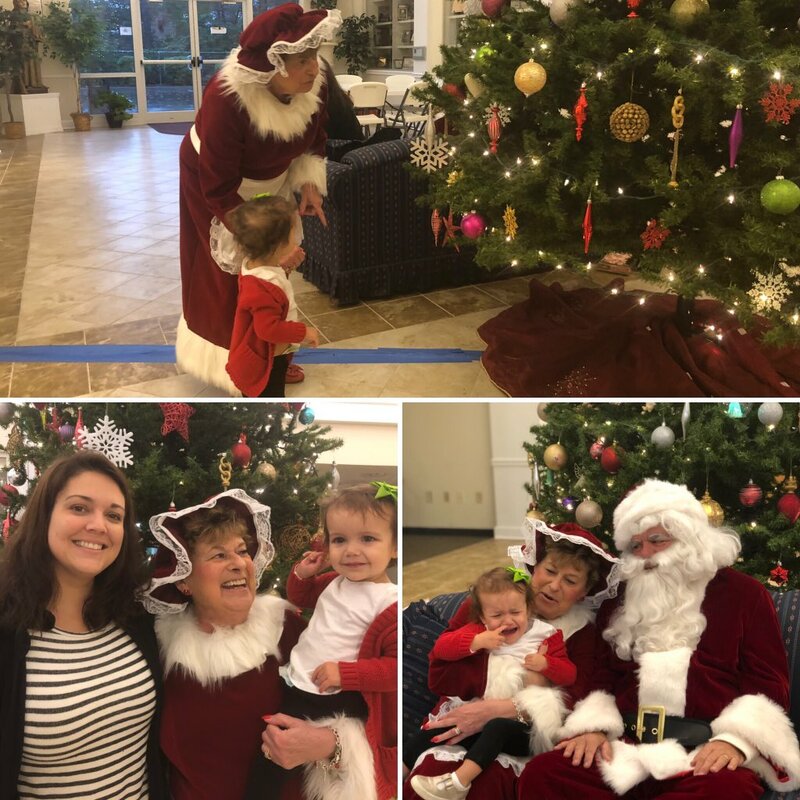 At the start of the breakfast, Mrs. Claus was guiding Sloan around the beautiful tree that was set up in our church’s community center, pointing out different ornaments. By the end of the breakfast, the roles were reversed! Sloan was taking Mrs. Claus by the hand and excitedly pointing at what was hanging from the branches. Sloan didn’t warm up to Santa at the St. Andrew Knights of Columbus pancake breakfast but she did really enjoy Mrs. Claus. 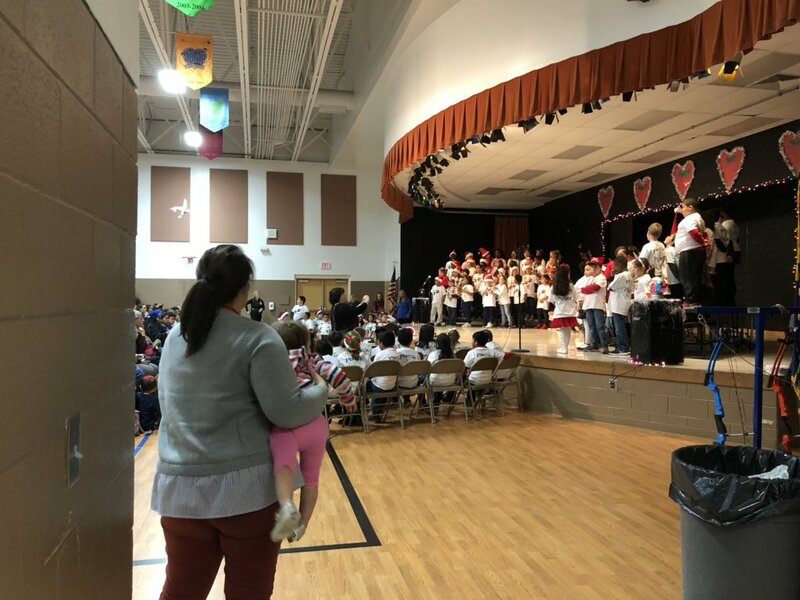 Christmas Music Program – Last week, the 2nd graders at Palmetto Bays Elementary School staged their holiday music performance. Wanting to show our support, Sloan and I surprised Mrs. Reser a couple minutes prior to the concert. Sid was so happy to see us! Throughout the performance, Sloan danced her heart out and tried to rush the stage. It was pretty cute. Sloan will have her chance to be the center of attention tomorrow as OCA will hold its Christmas performance. Sloan couldn’t be contained at the Palmetto Bays 2nd grade Christmas program! She just wanted to dance and rush the stage. Another Holiday Comic Laugh – I can’t help but share these funny Christmas-related comics so I hope you don’t mind. Poor Santa, little does he know about the evolution of his image over the years. I just hope Amazon was able to exchange his purchase for something that will be a little more suitable for Christmas Eve. Santa was definitely “off the mark” on this. Interesting Articles – I wanted to share a couple of interesting articles I read last night. The first one is from the New York Times and tells the hilarious story of a Utah government worker who had an email disaster. Intending to send a holiday potluck email to her small unit of workers in the Utah Department of Corrections, she accidentally sent it to all 22,000 government workers in the state! The “reply all” responses that ensued are hilarious! The second article was sent to me by Lindsay Hickman, a current grad student at CCU. The story describes a near-impossible assignment given by a professor at Missouri State University. The faculty member, holding the belief that it is much harder to go viral than people think (I agree! ), challenged his students to do just that. He thought there was no chance that his students could succeed in reaching 7,000 people, let alone 7.75 million. To find out what this group did to get so many views, click here. It is crazy how fast everything is going. My last day at work for the year will be next Friday! Speaking of a year that is quickly coming to an end, be sure to make these last 18 days of 2018 count. Hope you all have a great weekend. Don’t Blink. Josh Norman – After meeting Rachel Swindler last Thursday, I had the opportunity to be around another celebrity on Saturday. All-star NFL cornerback Josh Norman of the Washington Redskins is a CCU alumnus. He returned to campus for our Homecoming game this past weekend. However, he didn’t return just to watch some football; rather, he was here so we could properly honor him for making the largest donation to CCU ever by a former student-athlete. Our field house was renamed the Marrio and Josh Norman Field House during a ceremony between the first and second quarters (Marrio is Josh’s brother). Josh also established scholarships in the honor of two professors here at Coastal, one of them being Robin Russell. The whole time he was on campus, Josh was very humble and gracious. He interacted with fans, posed for numerous photographs, honored his family, and expressed how much Coastal means to him. 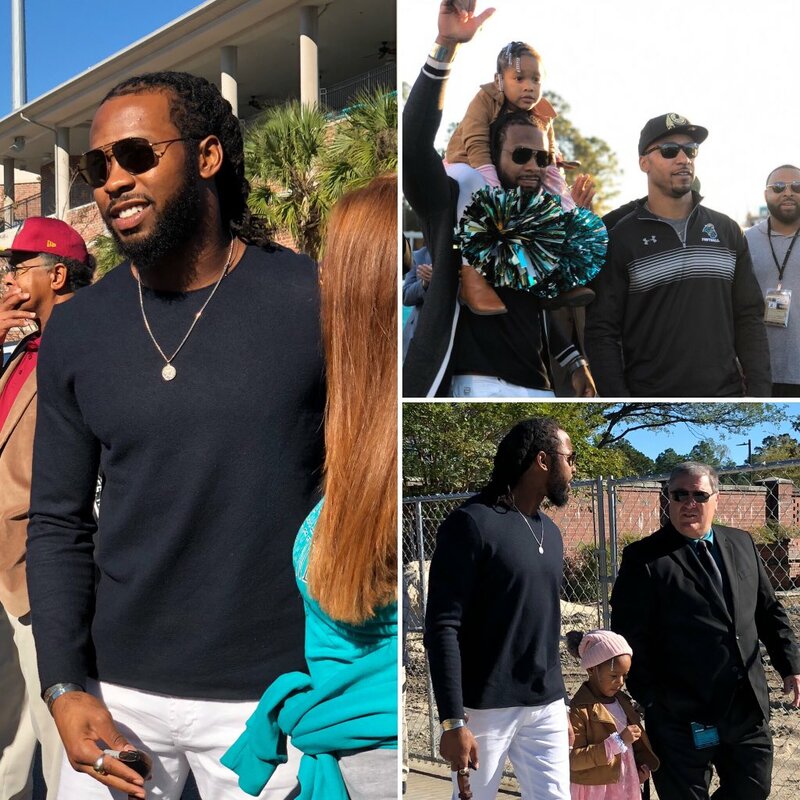 I took these photos of Josh Norman when he visited CCU this past weekend. Sloan is doing great! This photo was taken outside of Oxford Children’s Academy earlier this week. The Election That Shocked the Nation – Two years ago the unthinkable happened. In a scenario that no one saw coming, especially the mainstream media, Donald Trump defied the odds and won the 2016 Presidential Election. I remember that night really well – laying in bed, watching the coverage as the jaws of media personalities (and American citizens) dropped. Waking up the next morning after the election was officially called, I had a surreal feeling that I can still sense inside of me. In one of my most read and memorable blog posts, I wrote about Trump achieving the improbable. 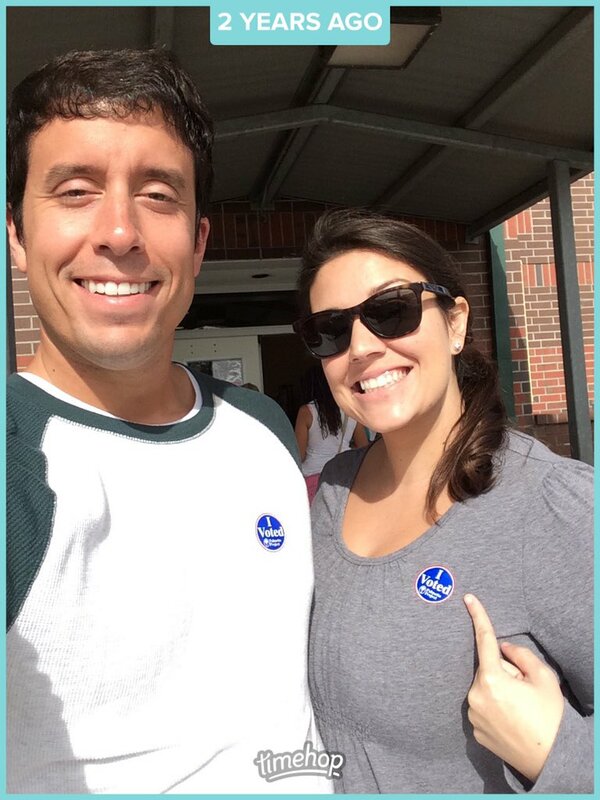 Sid and I after we voted on Nov. 8, 2016. My Instagram audience really appreciated this advice. I Love Ice Cream…But No Thank You – This week, an ice cream company on the West Coast called Salt & Straw introduced some Thanksgiving-themed flavors. No, we aren’t talking pumpkin spice or apple pie – think much more extreme. The business is boasting flavors such as sweet potato casserole, roasted peach and sage cornbread stuffing, salted caramel Thanksgiving turkey, and, worst of all, spiced goat cheese and pumpkin pie. No, no, no, and no. Even for an ice cream maniac like myself, I wouldn’t touch any of those flavors. Let us keep those who lost their lives in the senseless California bar shooting in our prayers tonight. 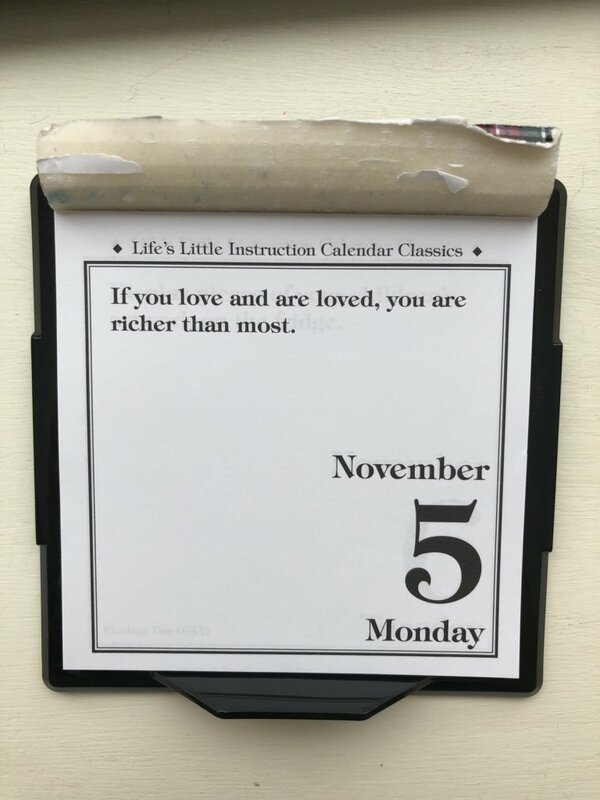 While we do this, let’s keep in mind how lucky we are to still be alive and happy. Don’t Blink. Trick-Or-Treat Chart – I was smiling from ear-to-ear when Sidney showed me this “How Kids Judge Halloween Candy” graphic. 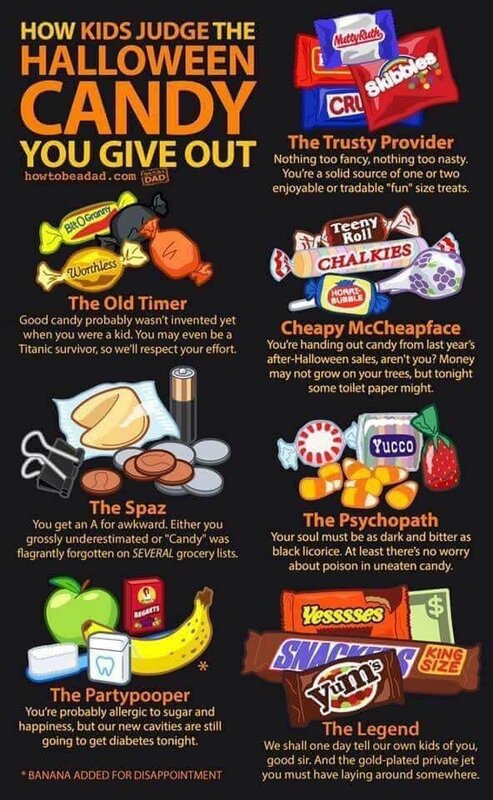 Although I have written about Halloween candy before, this is much more comprehensive. Sid came across it on the Facebook wall of a friend and sent it to our Reser Pride 8.0 family text message group so everyone could enjoy. We dubbed my mom “The Trusty Provider” with a pinch of “Cheapy McCheapface” mixed in. How does that work out? Because my parents get hundreds of trick-or-treaters every Oct. 31, they usually run out of the Skittles and Baby Ruths by the end of the night. To last them the final hour, they usually have to retrieve the Double Bubble bucket in the basement reserved for my dad to chew on when refereeing football games. 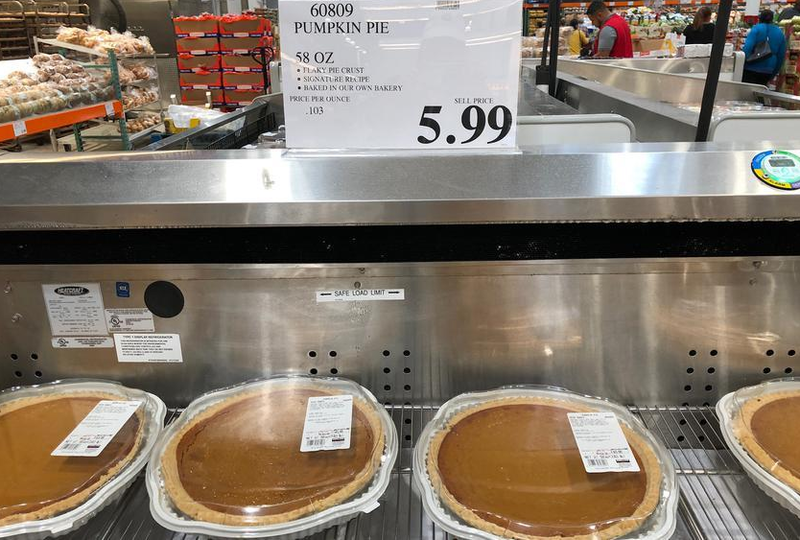 Costco Pumpkin Pie Facts – I bit on the clickbait last night and followed the link to the 15 Things You Didn’t Know About Costco’s Pumpkin Pie. As someone who loves pumpkin pie and is fascinated by Costco, I couldn’t resist. The facts are pretty interesting as they reveal the type of pumpkins used, where the seeds go, and the origin of the recipe. It is worth a read. Coincidentally, a year ago on this date I counted down my top five pumpkin-inspired foods. The Costco pumpkin pie is a classic. Sloan the Firefighter – Sloan’s daycare, Oxford Children’s Academy, is incredible. The latest activity the center hosted was a meet and greet with Horry County firefighters. The department sent more than just its people – a big fire truck pulled up in the parking lot as well. The teachers said the toddlers really enjoyed looking at the vehicle out the window but got a little anxious once they stepped outside. When the siren sounded and the lights flashed, Sloan was pretty alarmed. But she eventually calmed down and admired the fire fighting machine in front of her. Best of all, each child was given a hat to bring home. Not a bad way to spend a Wednesday. 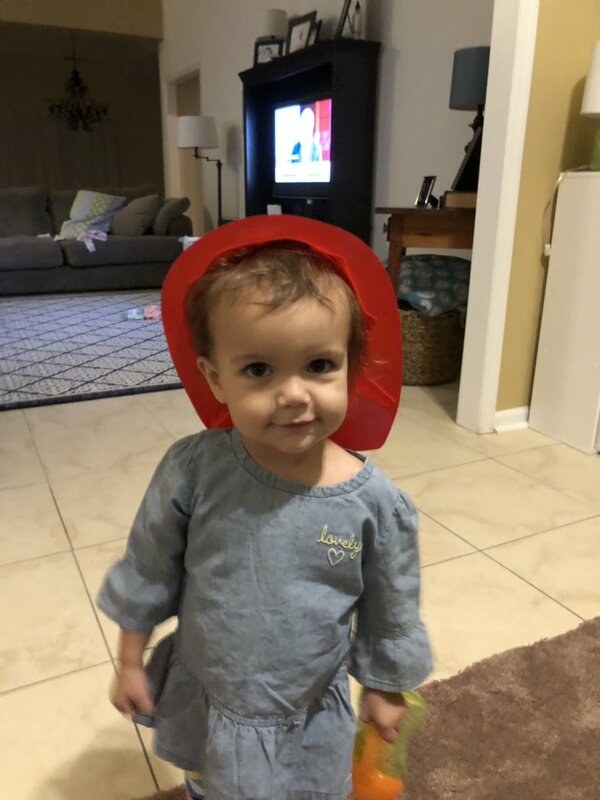 Sloan wearing the fire fighter hat she was given at daycare yesterday. Chauncey’s New Ride – I have mentioned on a few occasions that a role I played at the University of Montana was mascot coordinator. Not only did I star in videos with Monte, but I organized all of his entrances into Washington-Grizzly Stadium as well. There was always pressure to come up with new and daring ways for him to make his grand appearance. I wish he had what Chauncey recently received. 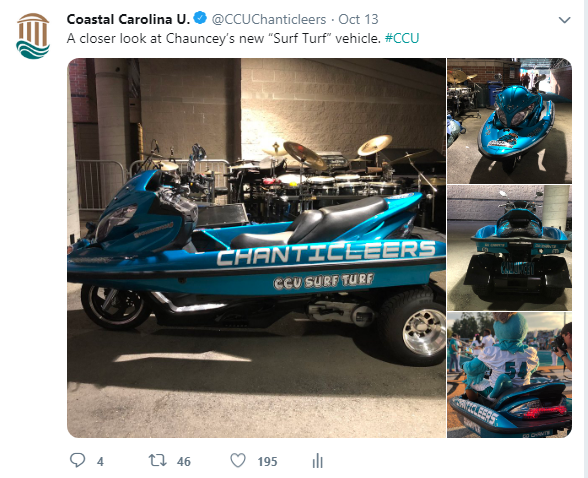 Our CCU mascot now has his own “Surf Turf” vehicle to get around Brooks Stadium. Efficient and eye-catching, I hope he gives me a spin in it one of these days. Chauncey’s new “Surf Turf” vehicle is pretty cool. Hey, Watch This – I usually don’t share pieces from news magazines on this blog, but I have to make an exception for what I saw on Sunday night. 60 Minutes caught up with National Geographic photographer Joel Sartore. His job is to go around the world and take photos of the rarest animals on the planet. He says he tries to capture the emotion of each animal just as if he was photographing the senior portraits of a human. His talent will take your breath away and the dangerous situations he has found himself in will make you jump. His photos are out of this world and his subjects are as eclectic as they come. I recommend watching it. 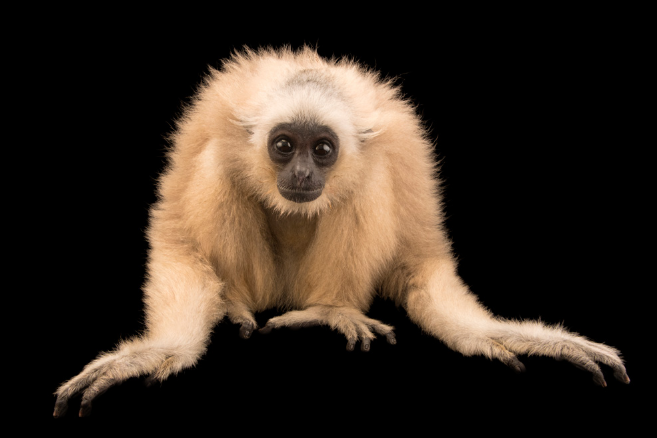 An image that Joel Sartore took of a rare gibbon. Kind of an interesting Thursday Rundown, right? Well, at least I hope. Enjoy your evening and I will catch up soon. Don’t Blink. Today, students reported back to class here at Coastal Carolina University. A few miles away from campus, Sidney reported back to work at Palmetto Bays Elementary. Although she will be without students today, Mrs. Reser will be joined by her second graders tomorrow as Horry County Schools will resume instruction across the district. It has been quite the 21 days, a passage of time that definitely did not fly by. But we made it. In tonight’s blog post, I wanted to share 10 quick tidbits from this unprecedented Hurricane Florence/major flooding period. * Sid’s students have been out of class longer than they have been it. She says that they will be essentially starting over. Today we had a welcome back event on campus. 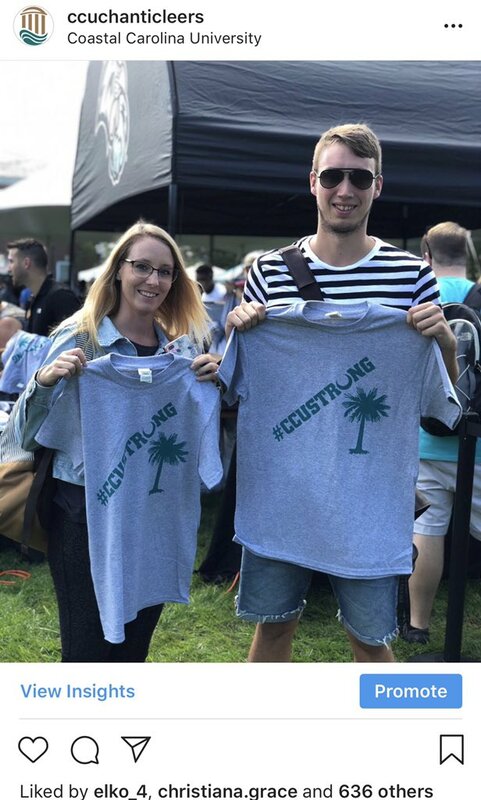 We gave out these #CCUStrong t-shirts. * The weekend that Hurricane Florence hit our area (Sept. 15-16), my parish, St. Andrew, took the extraordinary step and canceled all masses for that weekend. With the church extremely close to the ocean, it was a necessary decision. Luckily, thanks be to God, our beautiful place of worship received little damage. St. Andrew canceled masses during the Hurricane Florence weekend. Thankfully, the church was unharmed. * Hurricane Florence/flooding didn’t keep Sloan’s daycare out of commission for long. Seriously, Oxford Children’s Academy is the best. 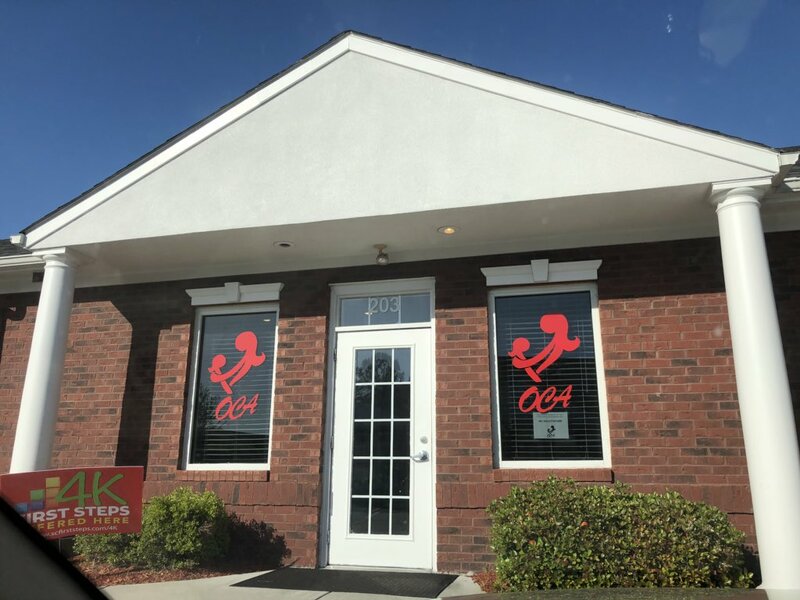 Although its policy is to follow the lead of Horry County Schools, our daycare opened up on Tuesday, Sept. 18, and stayed open the remainder of the month. Thanks to Oxford Children’s Academy for offering great hours and doing what a lot of other daycare centers wouldn’t. * Sidney’s school came to the rescue. 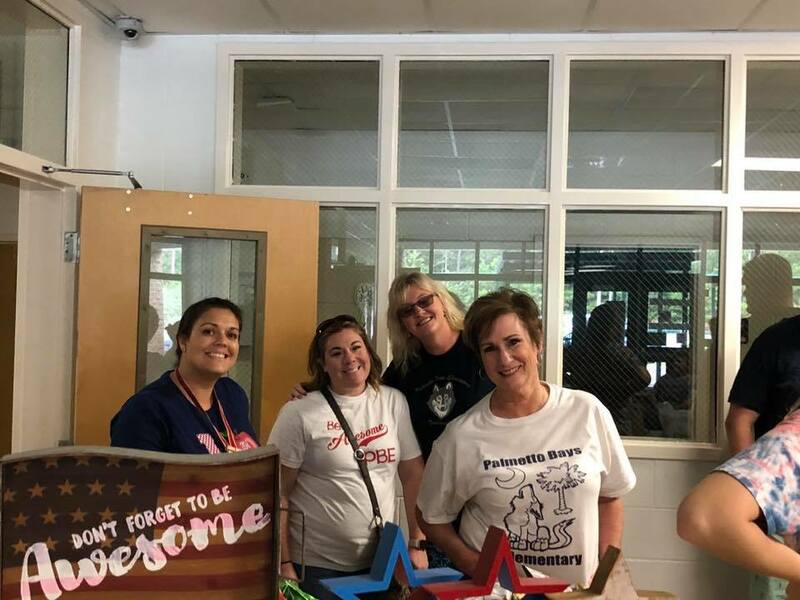 Not wanting its students to feel disconnected from their teachers and classmates, Palmetto Bays staged an event at a Bojangles location for the school community. Families were encouraged to attend for free food and the opportunity to say “hi” to the teaching staff. Sid and some of her other teachers back at school after the Bojangles event. * Local and regional businesses helped out. Many hotels in the Grand Strand area offered reduced room rates to people displaced by flooding. Organizations around the South offered perks for those impacted by Florence. For example, the Atlanta Braves and Florida Gators both offered FREE tickets to North and South Carolina residents. The Jacksonville Zoo provided our family with discounted admission passes. 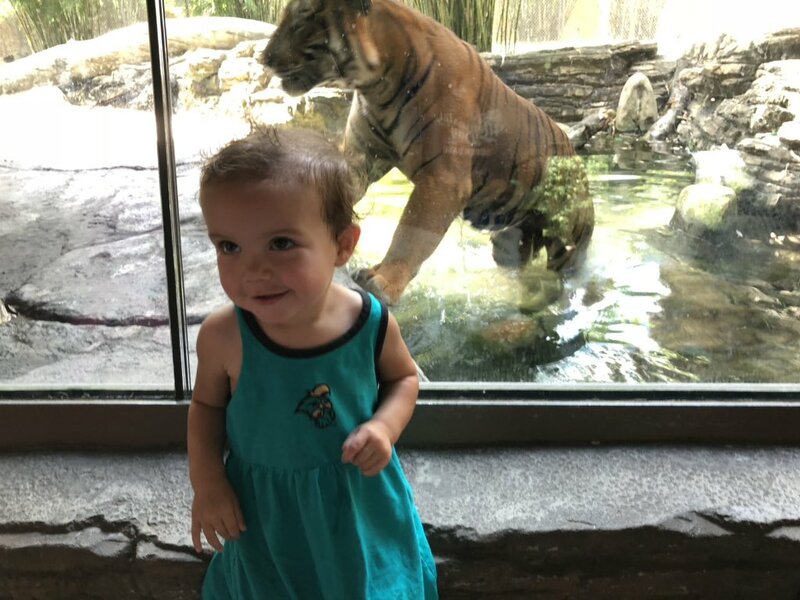 The Jacksonville Zoo offered us discounted tickets. * Our football team made headlines. The Coastal football team was on the road for nearly two weeks, spending a bulk of the time in hotels in the Jacksonville area. The Chants made the best of it, winning two games, including a Wednesday afternoon matchup that was changed at the last minute. Out of all the articles written about the experience, I enjoyed the USA Today story the best. * My relatives reached out. Things started to look pretty serious when the national news networks started to forecast a direct hit on Myrtle Beach. I had relatives and old friends reach out to check on us. When the forecast turned especially bad, my poor mom had a tough time keeping it together at work when people would ask her how we were doing. * We were so fortunate. I can’t say enough how lucky our little family was. Things were looking pretty bleak at one point so to come away unscathed was truly a gift from God. * We are #CarolinaStrong. I learned a lot about the resolve of this area. People and groups have gone out of their way to help others, demonstrating how special this part of the country is. I couldn’t be more proud to live here. 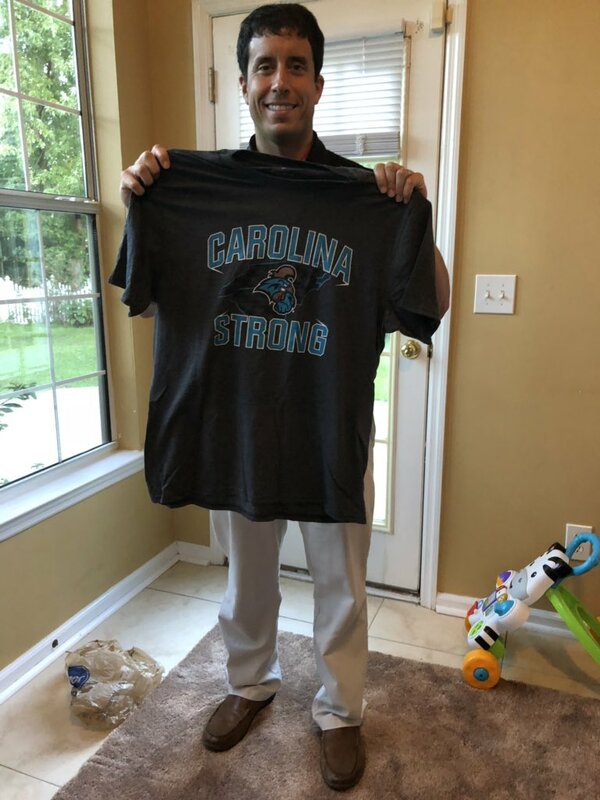 I am proud to be #CarolinaStrong! Although our family can move on, many others must rebuild. As we continue to live our lives, it is important to remember those not as fortunate as us. Don’t Blink. 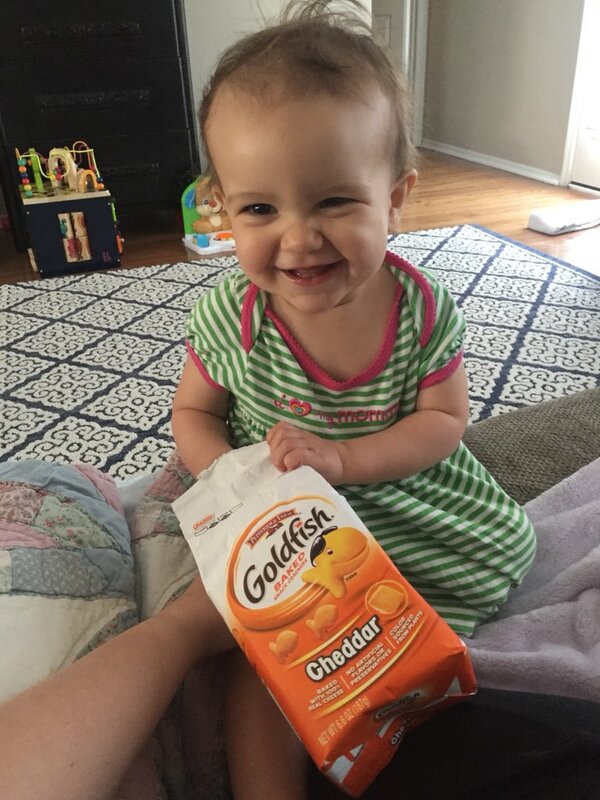 When a “Big Brother” season is airing, Sidney and I will supplement watching the actual episodes with viewing the live feeds of the Big Brother house that are active 24/7. Watching the unfiltered, raw content is pretty entertaining. However, it is the month of April and “Big Brother” won’t return until June. But don’t worry about us, we have something even better to watch than the Big Brother live feeds; we have the Oxford Children’s Academy live feed!! You can see everything that goes on within the walls of Oxford Children’s Academy, even if you are miles away! 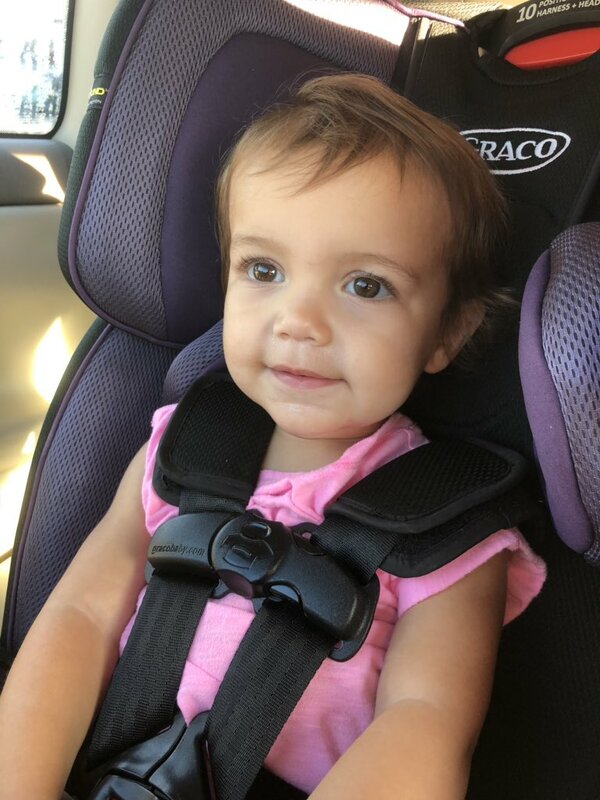 When we changed Sloan’s daycare provider, we entered a technological renaissance. We now check her in electronically, view her daily logs online, and receive notifications the second she enters or leaves the center. But the best modern tool we have gained with the switch is the live streaming service. Whether on a computer or from my phone, I can check on Sloan whenever I please, thanks to a camera that is set up in her classroom that pans the entire area. The Oxford Children’s Academy partners with Watch Me Grow, a streaming video system service built specifically for childcare centers. Watch Me Grow is the industry leader and for good reason. The product delivered is not a rinky-dink, convenient store black and white shaky picture. Rather it is a colorful and comprehensive clear look into our daughter’s classroom. It didn’t take us long to start taking advantage of the resource. The first time I logged in and saw Sloan’s vibrant classroom with babies crawling all over was pretty cool. Up until that point, I had always wondered what Sloan did and how she interacted with others at daycare. I now had an idea. Like with all good things, moderation is key. It is easy to become preoccupied with the live feed in a way that you are constantly signing in to check on your baby. If you lack will power or are just completely obsessed with your child, the streaming option could be your own worst enemy. Nobody wins when you sacrifice all productivity to watch nap time. Even when we can’t be with Sloan at home, we can still see her at daycare. In my case, I try to use the daycare live feed as a reward. I will challenge myself to tackle several items on my checklist before briefly scoping out the action in the Little Clouds (name of Sloan’s age group) classroom. If I work hard enough, this incentive usually allows me to view Sloan 3-4 times per day, with the lunch hour included in that allotment. I try to look for just a minute or so but it is enough to give me a boost. 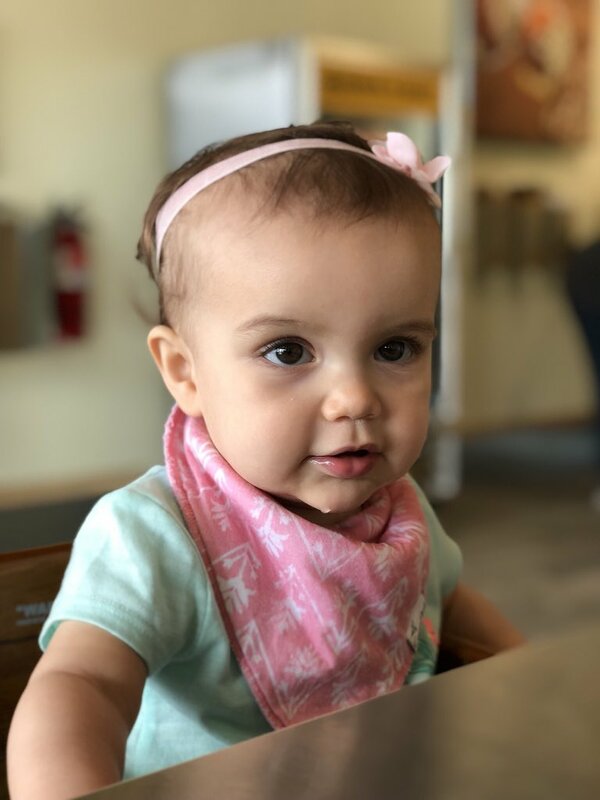 When I am done I find myself more motivated to get back to work because of the peace of mind and happiness I received from viewing my daughter in a safe and nurturing environment. The live stream at our daycare is great for spouses. Sidney and I update each other on how Sloan is doing during the day. Because we sign in at different times, we help paint a more comprehensive picture by “comparing our notes.” Usually our updates tilt toward the humorous side (Sloan is stealing someone’s snack again/How embarrassing, she is eating her socks). The live feed even allows us to monitor each other! Yesterday evening I went to pick up Sloan. I started looking in her cubbie and around the classroom for her shoes. All of a sudden I had an incoming call. It was Sidney. Before I could say anything, she told me she didn’t send Sloan with shoes today. Because she was watching the stream, she was able to put me out of my misery before I embarrassed myself too much looking for shoes that weren’t there. Despite all the positives I listed above, the most redeeming quality of the live feed is this: Sloan’s daycare is confident and transparent enough to install cameras that allow picky and protective parents to watch every single moment that occurs in those classrooms. In my opinion, that is comforting. The Oxford Children’s Academy show will go on! I know Sid and I will continue to get plenty more laughs and assurances out of it. Move over “Big Brother,” we are watching something much better. Don’t Blink. Happy April and welcome to the Thursday Rundown! I have visitors so I must be quick with tonight’s edition. Let’s reveal the five topics. Parents In Town – For the first time since last April, I have both my parents in town! 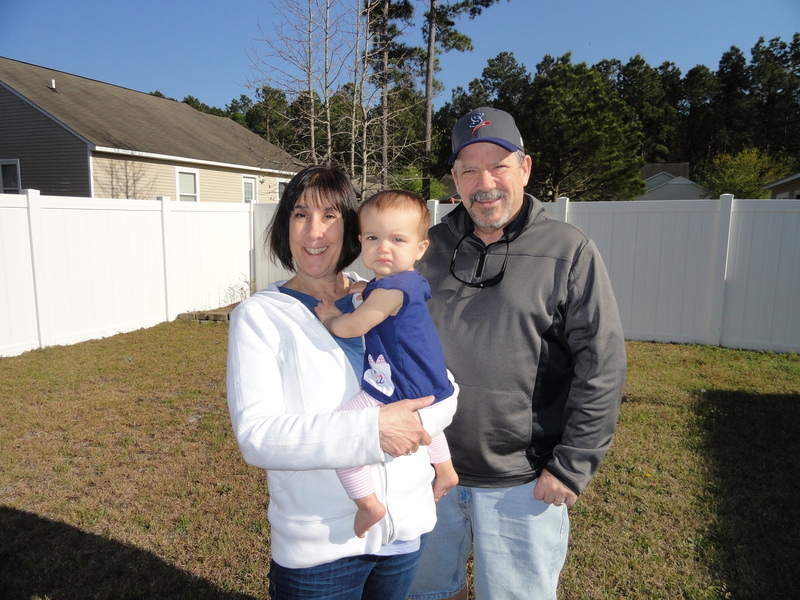 They arrived yesterday and Sloan greeted them with a very warm welcome, calming the fears of my mom who thought her granddaughter might be scared after not seeing them for several months. Their trip is already off to a great start and I get to enjoy my mom and dad throughout the weekend. My parents are loving every minute they have with Sloan. Wild, Wild Country – I will devote a blog post to this Netflix documentary in the future but I thought it was worth mentioning in the Thursday Rundown. With one episode to go in the six part series, I am amazed and entertained at this incredible and bizarre tale. Long story short: A large group of people (the Rajneeshees) devoted to an Indian guru leave India and settle near an Oregon small town in the 1980s. An epic culture clash between the locals and Rajneeshees ensues. If you want to know what I am talking about when I write my future blog post on the documentary, I suggest you start watching it now. 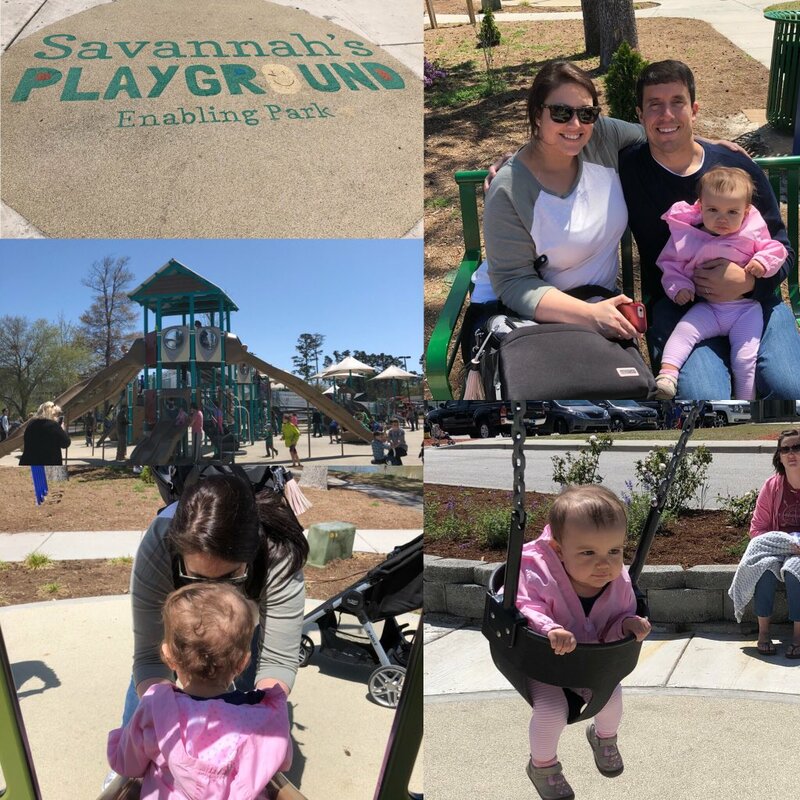 Savannah’s Playground – This afternoon, our family plus grandma and papa went to the most popular playground in Myrtle Beach, Savannah’s Playground. An entertainment oasis for children of all ages who want to play outdoors, the playground was built for $3 million and is compatible for those with physical and mental disabilities. It is named after Savannah Thompson, a local hero who has Williams Syndrome, and someone who I actually know. We had a nice time visiting the playground on this gorgeous day as Sloan enjoyed the swings and slides. A collage of our afternoon at Savannah’s Playground. Change For Sloan – A big decision for any parent is where to send their child to day care. After much contemplating, we switched day care providers for Sloan. The previous one she attended had some fine teachers but an opportunity presented itself and we enrolled her in a center that makes more sense for our family. She now attends Oxford Children’s Academy, a place that is much closer to the workplaces of both Sidney and I. It also offers flexibility, modern amenities, and several parents/babies who we know. Sloan started this week and has made a nice transition. Sloan started a new day care this week. From the Archives – How about we look at the blog posts I have written on April 5? 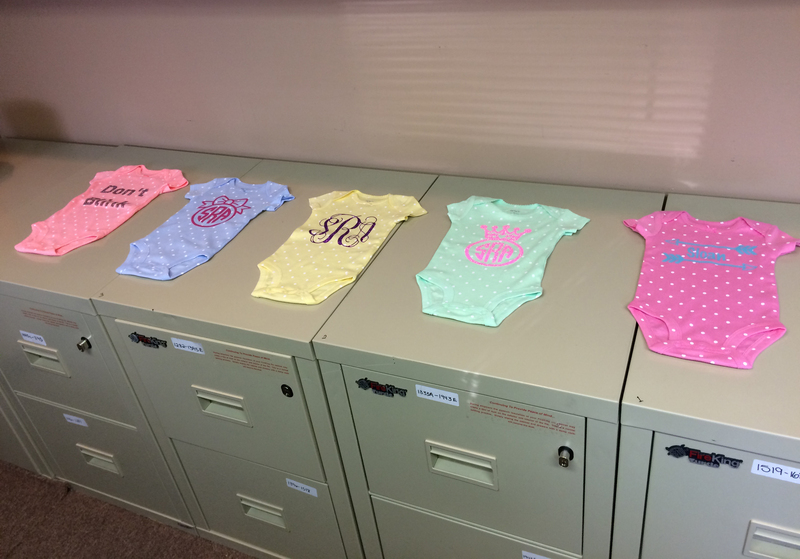 One year ago, I wrote about a surprise baby gift we received for Sloan. Let me tell you, it was a present that we were able to use a lot. On April 5, 2016, I wrote about how our family restaurant was finally set to re-open (by new owners) after sitting empty for several years. Then, three years ago on this date, I wrote a blog post about how creepy Easter Bunnies are. All three posts are pretty good reads so if you have time I suggest looking one or two of them up. What am I doing pecking away on a keyboard?! My parents are here! Thanks for reading and I will catch back up with everyone on Monday. Don’t Blink.